1884 10/- Pale Ultramarine, SG 183a, lettered B-E. A very fine used example. 1934 Re-Engraved 10/- Indigo, SG 452. An unmounted mint example with slight toning. 1913 10/- Indigo-Blue, SG 402. A superb used left-hand marginal example together with superb colour. 1913 £1 Green, SG 403. A superb used example with Guernsey cds. 1915 2/6d Pale Yellow-Brown, SG 405/6, N64(3). A very fine CDS used example. 1915 2/6d Sepia-Brown (Seal Brown), SG 408, N64(1). SUPERB USED. 1915 5/- Bright Carmine, SG 409. A superb used BLOCK OF SIX - a Rare multiple. 1915 10/- Pale Blue, SG 413, Spec N70(4). A SUPERB USED example. 1918 10/- Dull Grey-Blue, SG 417. 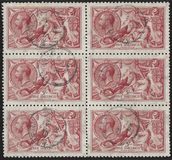 A superb used BLOCK OF NINE with Guernsey cirtcular datestamps. 1882 £5 Orange, SG 137, lettered A-E, overprinted 'SPECIMEN', Type 11, Spec J128t. Very fine lightly mounted mint. Cat £4500. 1877 10/- TELEGRAPH COLOUR TRIALS, Watermark Maltese Cross. 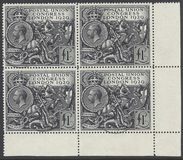 A superb bottom row of four in GREY-GREEN, overprinted 'SPECIMEN', TYPE 8, and showing bottom marginal inscription "TELEGRAPHS TEN SHILLINGS.". Stamps unmounted mint. Spec L 235. 1918 2/6d Olive-Brown, SG 413A. A very fine unmounted mint example. 1913 2/6d Sepia Brown, SG 400. A very fine mounted mint copy overprinted 'SPECIMEN', Type 26, Spec N63(2)s.
1918 2/6d Pale Brown, SG 415A, Series I, Plate 3/5. A superb used "Eaton Terrace" cds. 1934 Re-Engraved 2/6d to 10/-, SG 450-452. A superb used set of Three. 1918 2/6d Pale Brown, SG 415A. A very fine mounted mint example. 1915 2/6d Deep Yellow-Brown, SG 405. A very fine used cds copy. 1913 10/- Indigo Blue, SG 402. A superb used example. 1915 2/6d Pale Brown, SG 407. A very fine used cds example. 1913 2/6d Sepia Brown, SG 400. A Superb Used cds copy. 1934 Re-Engraved 10/- Indigo, SG 452. A very fine used block of four with cds. 1891 £1 GREEN, SG 212, lettered Q-D, STATE II, FRAME BREAK as listed in GB POSTAGE STAMP VARIETIES by R C Alcock, Page 27. Very fine mounted mint. 1884 10/- Deep Ultramarine, SG 183, J-B. A very fine mounted mint example overprinted 'SPECIMEN', Type 11, Spec K14s. Superb Colour. 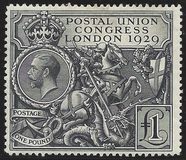 1919 10/- DULL GREY-BLUE, SG 417. Very Fine Lightly Mounted Mint. 1915 2/6d GREY-BROWN, Spec N64(6). SUPERB Mounted Mint. 1913 5/- ROSE-CARMINE, SG 401. Overprinted 'SPECIMEN', Type 26, Spec N66s. Superb Lightly Mounted Mint. 1913 55/- ROSE-CARMINE, SG401. Very fine used. 1912 2/6d DARK PURPLE, SG 317. SUPERB USED. 1912 10/- BLUE, SG 319. SUPERB LIGHTLY MOUNTED MINT. 1912 5/- CARMINE, SG 318. SUPERB LIGHTLY MOUNTED MINT. 1884 10/- ULTRAMARINE, SG 183, G-A. Superb Used with 'BAKEWELL' cds. 1891 £1 Green, SG 212, D-D. 'SPECIMEN', Type 11, Spec K17t. Lightly Mounted Mint. 1884 2/6d Lilac, SG 178, C-B. Superb Lightly Mounted Mint. 1883 10/- Grey-Green on Blued, SG 131, G-C. Superb Used, GLASGOW cds. SUPERB COLOUR. Light horizontal crease. Cat £4800.